Detail from Chris Ware’s Building Stories (Pantheon Books, 2012). 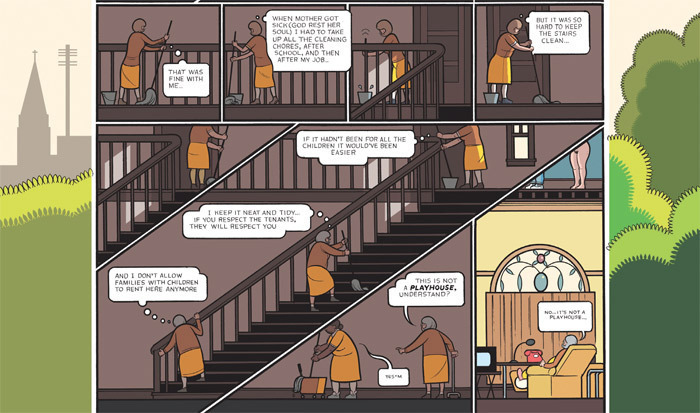 Building Stories, by Chris Ware. New York: Pantheon, 2012. 260 pages. CHRIS WARE’S COMICS in the 1990s and 2000sespecially his massive graphic novel Jimmy Corrigan, The Smartest Kid on Earth (2000)made him one of the most widely praised creators we have. Ware’s work was and is compelling in its meticulous self-consciousness about comics form, with complicated diagrams and schemes whose elegance belies the melancholy of the people who have to inhabit them. Yet Jimmy Corrigan had a certain coldness, even a predictability: Its people were smaller, sadder, flatter than the cityscapes and panels around them, and they seemed to shrink as the pages went on.